Former Yankees shortstop, Derek Jeter, managed to survive twenty years under the glare of the New York media. However, he now finds himself locked in a court battle with suits and countersuits and numbers like $30 million thrown around. And it’s all about underwear. Former Yankees All-Star shortstop Derek Jeter is estimated by Forbes Magazine to have generated $400 million in total career earnings, including $130 million from endorsement partners like Nike’s Jordan Brand, Gatorade, Rawlings, Steiner Sports and Movado. Since his retirement from the Yankees, Jeter has continued to fly under the radar, maintaining a low profile except for the brief flurry of attention that was given to his wedding. Now, it appears that streak may be broken. 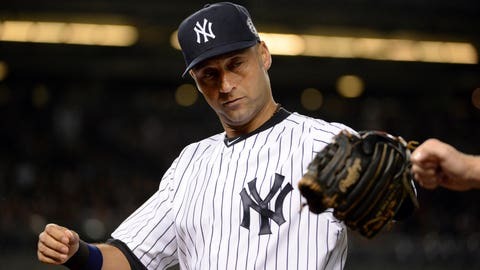 “Derek Jeter asked the Delaware Chancery Court late Monday to impose “severe” sanctions on the marketer of luxury undergarment brand Frigo, claiming the company is not making good on its agreement to pay his legal fees from a fight over endorsing the underwear. So far, no harm, no foul. These things happen when large amounts of money are at stake, and things don’t always go the way “partners” in a deal expected them to develop. TMZ also claims that the underwear company claims Jeter also pitched a fit when it selected 50 Cent as a brand ambassador because he felt it would make the brand “too urban” … allegations Jeter denied. The problem, of course, is Derek Jeter telling Page Six anything about anything. And beyond that, lurking in the background is the natural transition anyone can make from “too urban” to too black. Whether in code or not, the inference is out there and the reputation of Jeter is on the line. And that’s probably why he’s not taking this sitting down. It can’t be about the money, Jeter has plenty of that. But what has to matter to him most has to be the attack on him personally, after all these years with the Yankees. Unfortunately, this is bound to turn into one of those “He said, She said” battles in which no one can win. Next: Who’s Next To Be Run Out Of Town?